Thousands of residents fled ahead of a raging wildfire near northern California’s Santa Cruz Mountains, and one man said he had an "ominous feeling" as ashes descended on him. Helbard Alkhassadeh traveled down the state’s scenic Highway 1 between Davenport and Santa Cruz and submitted images of the blaze, named the Lockheed Fire, to CNN’s iReport. “I got to the point where the main plume was going over my head, and it was sprinkling ashes on me,” he said. “It’s an ominous feeling when you have ashes raining on you. It looks like a nice sunny day, then you drive into it, and it becomes like a volcanic cloud.” Late Thursday night, 2,800 acres were still burning — none of it contained, said Daniel Berlante, spokesman for the California Department of Forestry and Fire Protection. About 675 firefighters were on the scene battling the blaze with air and ground resources, he said. Hundreds more from across the state were on the way. No injuries have been reported so far. The cause of the fire that began Wednesday night was not known and was being investigated, said Cal Fire spokeswoman Megan McFadden. 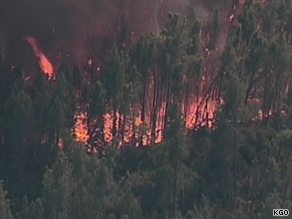 Winds were coming off the ocean and pushing the fire toward the town of Bonny Doon, Berlante said. The fire was threatening 250 homes and 25 businesses, and a mandatory evacuation order was issued for the Swanton area that affected 300 households. Berlante said up to 2,400 residents had evacuated in the Swanton and Bonny Doon areas. Mike Murrow, a plumber who lives in Felton, told CNN his company wasn’t taking any calls close to the fire. Although he was not home, he said he could see the blaze edging closer to his residence, and that made him “nervous.” A fire in the same area of Bonny Doon last year forced the evacuation of about 1,500 residents, officials said.